Covetrus is a dominant company in the pet health market. Despite slow growth in the past, management has laid out growth initiatives that should accelerate growth in the next few years. The merger that created Covetrus may allow the company to reap substantial synergies. Covetrus has a lot of potential ahead of it, yet doesn't trade at an outrageous valuation. 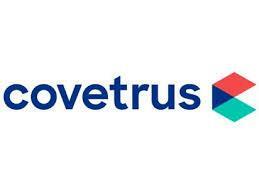 Covetrus Inc. (CVET), like most spinoffs, has fallen substantially since it started trading. Despite its high P/E and P/B, however, we believe the company is significantly undervalued. Covetrus is a secular grower that has massive potential and a long growth runway ahead of it. 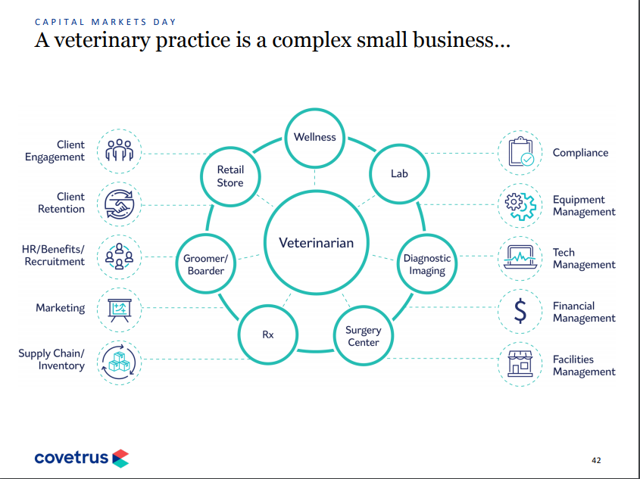 Covetrus is an animal health technology and services company that serves veterinarian practices by providing them with everything from distribution to management software to prescriptions management. It has operations globally but mainly operates in North America, where 90% of local practices are customers. The company is a spinoff of Henry Schein merged with Vets First Choice. It started trading on February 6, 2019. A veterinarian practice is a very complex business. The owner needs to manage everything from prescriptions to quality of care to finances. Vets manage an incredible array of medical services across different species of patients. It gets more complex as technology introduces new layers of complexity on top of the existing business. Client expectations are also changing, with pet parents expecting higher-quality care for a lower cost. Prescriptions are especially complex, with many needing refrigeration, many being controlled substances, and with each having its own manufacturer and applicable discounts. That's where Covetrus comes in. The company allows the owner of the practice to run it more efficiently and profitably by providing distribution and software services. Practices can streamline their operations, improve their working capital or cash flow, and use software to automate prescriptions. This allows the practice owner to more efficiently serve patients and earn more revenues and profits by refilling their inventory faster, as described below. Management gave an example - if a vet forgets to prescribe a medicine, Covetrus's system will email the customer to remind him/her to collect the medicine. Covetrus operates in the $150 billion pet health market. This market is benefiting from several secular growth mega-trends - the increasing longevity of pets and the humanization of pets. People are now willing to spend substantial sums of money to increase the longevity of their pets and to give them better care. This is great for veterinarian practices, which can generate larger amounts of revenues. It's also great for Covetrus, which gets a substantial performance-based fee from its customers. Interestingly, just by using Covetrus, practices can generate more revenues by refilling faster and more efficiently. 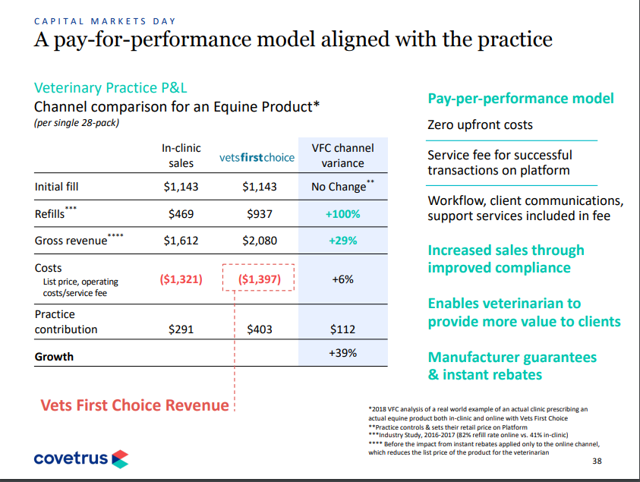 As an example, one Equine product refill rate doubled from 41% to 82% after using the Vets First Choice platform (owned by Covetrus). This grew revenues by 39% for the practice. Management stated that revenues from most practices increase YOY and that its 2012 customers recently grew 20% in 2018. Most notably, management stated that a mature practice usually pays Covetrus from $500k to $1 million per year, which means that at maturity, the company's current client base of 20000 practices may generate up to $20 billion in revenues, or 5x its current revenues. According to management, Covetrus has recurring subscription-like revenues that increase in visibility. Revenues from most practices improve YOY - for example, the 2012 cohort grew 20% last year. Management believes that the company is far from maxing out revenues from existing customers. 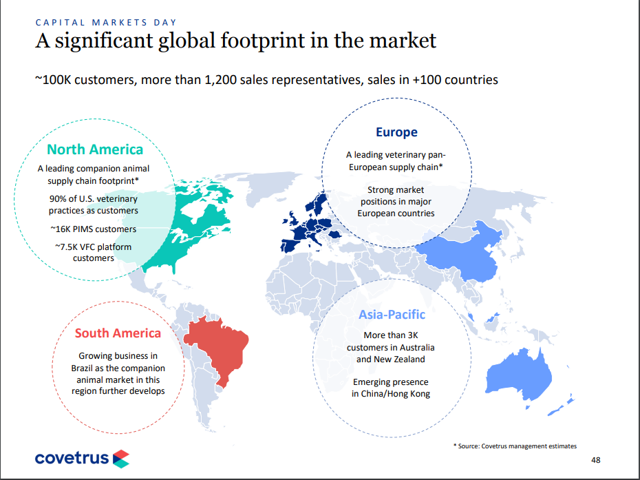 They believe that Covetrus can earn extra revenues from up-selling and cross-selling existing customers. Covetrus not only has strong growth drivers but also some extremely wide moats, which should allow it to maintain an edge over the competition. The most significant one, of course, is switching costs. It may take a while to setup and learn how to use Covetrus's system. For a veterinarian practice that sees patients every day and deals with life or death situations, taking time to switch to a new system is costly both to the practice and to the customer. Veterinarian practices are therefore incentivised to stick with Covetrus. The company also has low costs as it is the largest operator in this industry and can reap substantial economies of scale. 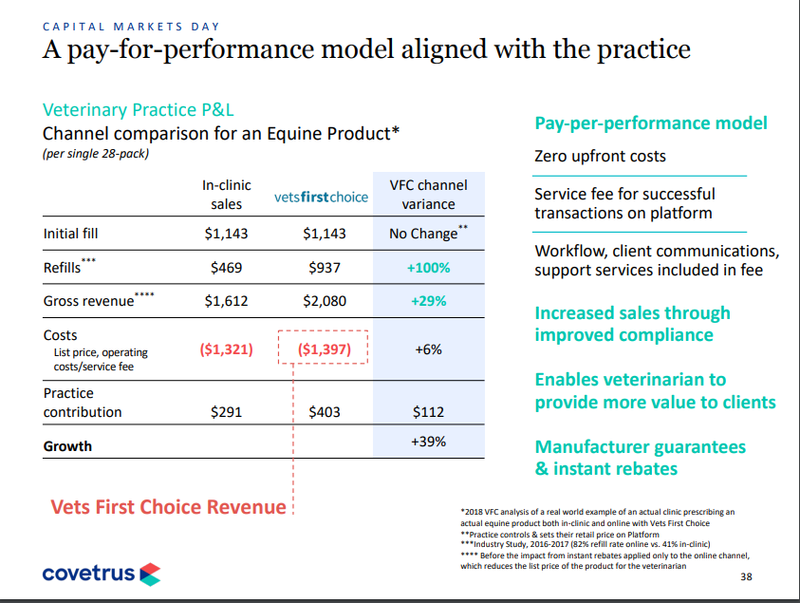 After the spin-off, Covetrus is likely to reduce costs even further as a result of synergies from the merger with Vets First Choice. Covetrus has a healthy balance sheet, with over $1.4 billion of shareholders' equity out of $2.2 billion in assets. Management has stated that it plans to deleverage further using $50 million of FCF the company plans to generate in the next 12 months, which seems quite prudent. Revenues have grown over the past 4 years, from ~$3 billion to ~$3.8 billion. Removing restructuring charges and normalizing taxes to 21% gives us $115 million of adjusted net income in 2018, up from $88 million in 2015. Covetrus currently trades at a market cap of $3.6 billion, which may seem excessive given its low net income. However, with significant synergies waiting to be exploited and an extremely large market to conquer, we believe this price is more than fair. In Warren Buffett terms, Covetrus is a "wonderful company at a fair price". Interestingly, a similar company, McKesson Corp. (MCK), which offers similar services except for human pharmacies, trades at a market cap exceeding $20 billion. If people are really beginning to humanize pets, this means that Covetrus has a much greater opportunity than most people think. Covetrus is a top-of-the-line animal health technology and service provider that has only exploited a small portion of its total opportunity. As management executes on growth and achieves promised synergies, we fully expect the multiple to expand and Covetrus to be revalued.